I’m not a complete health freak but I do like to incorporate a variety of colourful, unprocessed and generally worthy foods into my (and the family’s) diet. I’ll also admit to jumping on the superfood bandwagon, and I like to try out with what is currently trending. And the benefits of chia seeds can’t be beat. According to the packet they are “Authentic Aztec Superfood”. (This has been great fodder for my husband who takes the piss out of me daily about it.) But basically, they are the seeds from the chia plant and are gluten-free and really high in omega 3, protein, fibre and antioxidants. You notice that when they get wet, they go all gooey and expand in size. This is because they have a lot of fibre in them. They keep you full for ages and are really excellent for healthy poos. Because they provide a slow release of energy they are useful for maintaining your blood sugar levels. And evidently they are great for weight loss (sorry peeps, this is one effect that I haven’t experienced!). They have the highest plant source levels of omega 3 ALAs (alpha linolenic acids), which we all need for heart health. They come in black or white and I’m led to believe there isn’t a huge difference in the nutritional properties. 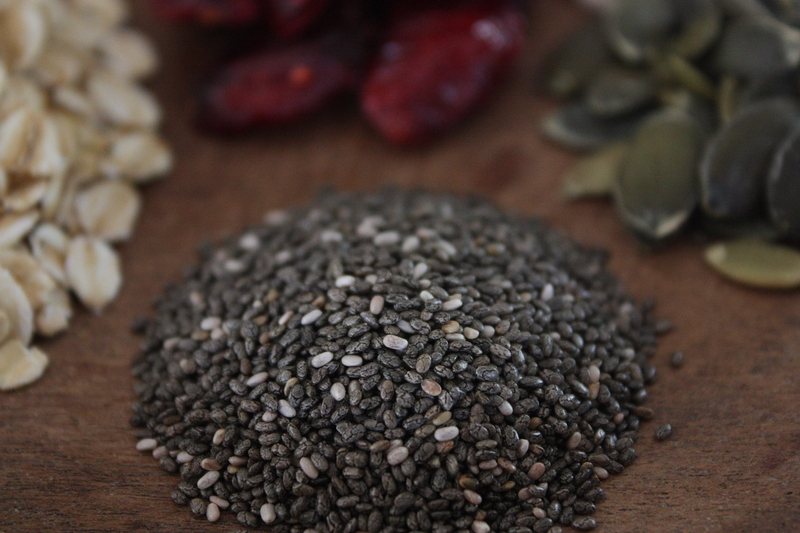 What the heck do you do with chia seeds? I have them most mornings in my breakfast. It’s really easy to throw a tablespoon in with your cereal or muesli. 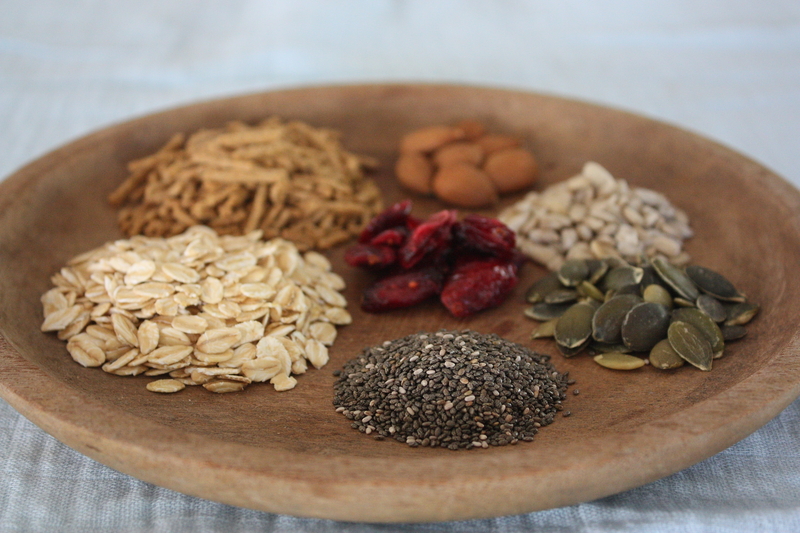 Pictured below is a typical breakfast for me of chia seeds, oats, bran, almonds, cranberries, pepitas and sunflower seeds. You can adapt this and put in whatever dried fruit or grain you prefer. You can include a spoonful in your smoothie. You might find that some kids notice them and don’t like them. My pre-schooler is pretty fussy but he doesn’t seem to be bothered by them, luckily. I bake them in muffins and bread as well. The recipe below is absolutely delicious and is courtesy of Melissa Ambrosini from Path to Wellness. While dates are soaking add nuts, cacao, shredded coconut, coconut oil and chia seeds to processor and mix. Add dates and process. If mixture is too dry, add either a tablespoon of water, or a little bit more coconut oil. Roll balls in shredded coconut and refrigerate. And finally if you are really adventurous you could try Gwenyth Paltrow’s take on chia seeds – a breakfast pudding (bleugh, no thanks! ).